How Is Wave Energy Used to Generate Electricity? The bulk of electricity that powers the industrial world comes from induction generators. The first one came online in 1896 and was powered by the falling cascade of water that is Niagara Falls. Most modern induction generators are steam-driven, though, and the fuels of choice to heat the water have long been been coil, petroleum and natural gas – so-called fossil fuels. As of 2011, fossil fuels supplied 82 percent of the world's electricity, but evidence continues to mount of the devastating effects the byproducts of combustion have on the environment. As of October 2018, scientists were warning that global warming, to which fossil fuel combustion is a prime contributor, was quickly approaching an irreversible tipping point. The result of such warnings is a shift away from fossil fuels and toward renewable energy sources, such as photovoltaic panels, geothermal energy and wind turbines. Wave power is one of the options on the table. The oceans represent a vast reservoir of untapped energy. According to the Electric Power Research Institute, the potential wave energy around the coastal United States, including Alaska, is around 2,640 terawatt-hours/year. That's enough energy to power to 2.5 million households for an entire year. Another way to look at it is that a single wave has enough energy to power an electric car for hundreds of miles. Four main technologies exist to harness wave energy. Some work near the shore, some offshore and some in the deep sea. Wave energy converters (WECs) are designed to remain on the surface of the water, but they differ in the orientations of the collectors to the movement of the waves and in the methods used to generate electricity. The four types of wave electricity generators are point absorbers, terminators, overtopping devices and attenuators. 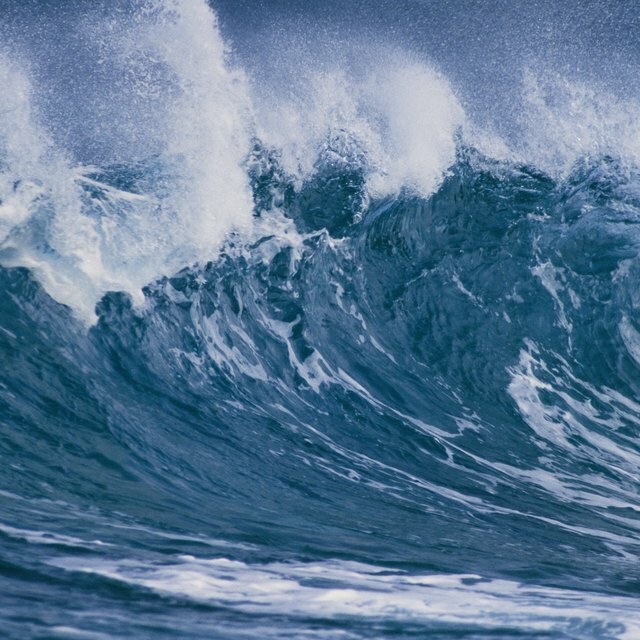 Believe it or not, wave power is another form of solar energy. The sun heats different parts of the globe to different extents, and the resulting temperature differences create the winds that interact with the ocean water to create waves. Solar radiation also creates temperature differences in the water itself, and these drive underwater currents. It may be possible to harness the energy of these currents in the future, but for now, most of the attention of the energy industry has been focused on surface waves. In a hydroelectric dam, the energy of falling water directly spins the turbines that generate AC electricity. This principle is used almost unaltered in some forms of wave generation, but in others, the energy of the rising and falling water has to pass through another medium before it can do the work of spinning the turbine. This medium is often air. The air is sealed in a chamber, and the motion of the waves compresses it. The compressed air is then forced through a small aperture, creating a jet of air that can do the necessary work. In some technologies, the energy of the waves is transferred to mechanical energy by hydraulic pistons. The pistons in turn drive the turbines that generate electricity. A point absorber is primarily a deep-sea device. It remains anchored in place and bobs up and down on the passing waves. It consists of a central cylinder that floats freely inside a housing, and as the wave passes, the cylinder and housing move relative to each other. The motion drives an electromagnetic induction device or a hydraulic piston, which creates the energy necessary to drive a turbine. Because these devices absorb energy, they may affect the characteristics of the waves that reach shore. This is one reason why they are used in locations far offshore. An oscillating water column (OWC) is a particular type of point absorber. It also looks like a buoy, but instead of a free-floating internal cylinder, it has a column of water that rises and falls with the waves. The motion of the water pushes compressed air through an aperture to drive a piston. Terminators can be located on shore or near the shoreline. They are basically long tubes, and when deployed offshore, they capture water through subsurface port openings. The tubes are anchored to extend in the direction of wave motion, and the rise and fall of the ocean surface pushes a column of captured air through a small opening to drive a turbine. When located onshore, the waves crashing onto the beach drive the process, so the openings are located in the ends of the tubes. Each terminator can generate power in a range from 500 kilowatts to 2 megawatts, depending on wave conditions. That's enough power for an entire neighborhood. Like terminators, attenuators are long tubes that are deployed perpendicular to the wave movement. They are anchored at one end and constructed in segments that move relative to one another as the wave passes. The movement drives a hydraulic piston or some other mechanical device located at each segment, and the energy drives a turbine, which in turn produces electricity. Overtopping devices are long and extend perpendicular to the direction of wave motion. They form a barrier, much like a seawall or dam, that collects water. The water level rises with each passing wave, and as it falls again, it drives turbines that generate electricity. The overall action is roughly the same as the one employed in hydroelectric dams. The turbines and transmission equipment are often housed in offshore platforms.Overtopping devices can also be constructed onshore to capture the energy of waves that crash onto the beach. Despite the obvious promise of wave power, development lags far behind that of solar and wind power. Large-scale commercial installations are still a thing of the future. Some energy experts liken the state of wave electricity to that of solar and wind electricity 30 years ago. Part of the reason for this is inherent in the nature of ocean waves. They are irregular and unpredictable. The height of the waves and their period, which is the space between them, can vary from day to day or even hour to hour. Another problem is power transmission. Wave power can't serve any purpose until it is transmitted to the shore. Most WECs incorporate transformers to step up the voltage for more efficient transmission along underwater power lines. These power lines typically rest on the sea bed, and installing them adds significantly to the cost of a wave power generation station, especially when the station is located far from shore. Moreover, there is a certain amount of power loss associated with any transfer of electric energy. Energy.gov: How Are Ocean Waves Converted to Electricity? What Is a Swell in the Ocean? Deziel, Chris. "How Is Wave Energy Used to Generate Electricity?" Sciencing, https://sciencing.com/wave-energy-used-generate-electricity-6499297.html. 27 November 2018. How do I Measure Ocean Wave Energy?